We professionally install irrigation systems with the homeowner's pocketbook in mind! We do it right the first time and only use the highest quality parts to cut down on maintenance. Careful attention is paid to the correct placement of heads to maximize water conservation while providing adequate coverage. Automatic sprinklers offer convenience and control in protecting your landscape investment. 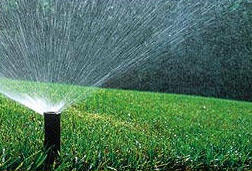 Irrigation systems help you to enjoy your yard, and to keep it healthy and beautiful. We install top quality systems from the Hunter Pro Series.